The Wall Street Journal, by Margaret Coker, Reuters (June 16, 2013) — Saudi Arabia is buzzing with speculation that international military intervention in Syria could be at hand after King Abdullah bin Abdulaziz Al Saud cut short his summer holiday in Morocco and returned to Saudi Arabia over the weekend and Washington announced that it would start arming Syria’s rebels. The state-run news agency reported Friday that the king had returned to Jeddah, the site of his summer palace, due to “repercussions of the events that are currently taking place in the region,” which Saudi officials and commentators said related to President Barack Obama’s reversal of policy in Syria. Until now, Saudi Arabia has been one of the loudest voices calling for arming the Syrian opposition, and for approximately two years the government has quietly allowed weapons to covertly reach some Syrian rebel groups. With recent news that forces from the Lebanese Shiite movement Hezbollah have helped President Bashar al-Assad’s forces re-take rebel-held territory, Saudi and other Arab officials have been pushing for more urgent international action on behalf of the rebel factions. Rather than relieve tension in the region about a spillover of Syria’s military conflict, President Obama’s decision last week to arm select rebel factions has increased worry that a greater regional war may be at hand – a fear that many people believed was behind King Abdullah’s return home early Saturday. Last week, U.S. officials confirmed suspicions that F-16 fighter jets and a Patriot missile defense system that were brought to Jordan for military exercises would now stay on in the Hashemite kingdom. That fanned speculation that Jordan may be preparing to declare a new safe haven inside southern Syria from which internationally supported Syrian rebel units could attack Damascus and Syrian refugees could live in relative peace until fighting has ended. Jordanian officials as far back as seven months ago have drawn up such contingency plans, which officials in Amman hope would help alleviate their growing Syrian refugee crisis and keep the tiny Middle Eastern kingdom free from fighting. Unease over the Syria situation prompted a sharp sell off Saturday on the Saudi stock market, which dropped by 4.6% to a 13-month low, amid heavy volume. King Abdullah, who turned 90 this year, has risked considerable personal political capital on overthrowing the Syrian president. Saudis, like the other Arab Gulf monarchies, see Syria as the latest and most important battleground for the sectarian rift that has dominated regional policy for the last decade, namely attempts by Shiite Iran to expand its hegemony over what the Saudis see as their traditional Sunni sphere of influence. 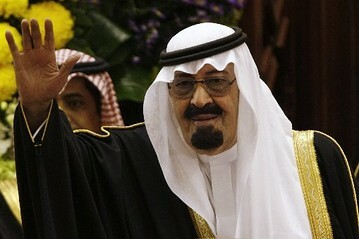 Throughout most his long career in public service, King Abdullah has been in charge of Saudi policy toward Syria, and people close to the king say that he felt personally betrayed when the younger Syrian leader rebuffed numerous attempts by the king since he came to power more than a decade ago to leave the Iranian fold and stand more solidly in the Sunni geopolitical camp. Part of the recent stepped-up rhetoric against Syria has come leading Sunni religious figures based in Saudi Arabia and elsewhere. Saudi preachers used their Friday prayer sermons to denounce President Assad and to demand that Saudis support the fight against injustice against Syrian civilians by all means necessary. “The bombs and their shrapnel are falling on them and their valleys are full of dead bodies. All of that puts on the shoulder of each one of us a share of responsibility before Allah, on leaders, rulers, scholars, reformers, thinkers and people to take a unified and conscious stand against the mad (crackdown) on our brothers in Syria,” Saudi newspapers quoted the imam of the Grand Mosque in Mecca, Sheikh Saud Al-Shuraim, as saying.